The city of Hood River is the seat of Hood River County, Oregon, United States. Timberline Lodge and Ski Area and Fire Museum in City Hall are good opportunities to explore the local culture. Step out of the city life by going to Columbia River Gorge National Scenic Area and Mount Hood. You'll find plenty of places to visit near Hood River: Multnomah Falls (in Troutdale) and Multnomah Falls (in Bridal Veil). There's still lots to do: examine the collection at Western Antique Aeroplane & Automobile Museum and learn about winemaking at Marchesi Vineyards. To see reviews, ratings, other places to visit, and more tourist information, use the Hood River day trip planning tool . Manchester, UK to Hood River is an approximately 16.5-hour flight. The time zone difference when traveling from Manchester to Hood River is minus 8 hours. When traveling from Manchester in July, plan for somewhat warmer days in Hood River, with highs around 30°C, while nights are about the same with lows around 17°C. Finish up your sightseeing early on the 17th (Wed) so you can go by car to Bend. Escape the urban bustle at High Desert Museum and River Rafting & Tubing. Oregon Observatory and City of Sisters are good opportunities to explore the local culture. Go for a jaunt from Bend to Redmond to see Smith Rock State Park about 38 minutes away. There's still lots to do: delve into the lush surroundings at Deschutes National Forest, tour the pleasant surroundings at Drake Park, explore and take pictures at Pilot Butte State Scenic Viewpoint, and explore the activities along Deschutes River. To see more things to do, ratings, traveler tips, and tourist information, read our Bend trip itinerary maker app . You can drive from Hood River to Bend in 3.5 hours. Other options are to do a combination of bus and flight; or take a bus. When traveling from Hood River in July, plan for somewhat warmer days and little chillier nights in Bend: temperatures range from 34°C by day to 13°C at night. Finish your sightseeing early on the 20th (Sat) to allow enough time to drive to Crater Lake National Park. Kick off your visit on the 21st (Sun): explore the striking landscape of Crater Lake National Park. Get ready for a full day of sightseeing on the next day: contemplate the long history of Rim Village Visitor Center, stroll through Cleetwood Cove Trail, and then cruise along Rim Dr.
To see maps, where to stay, ratings, and more tourist information, you can read our Crater Lake National Park trip itinerary site . Traveling by car from Bend to Crater Lake National Park takes 3 hours. Alternatively, you can do a combination of bus and taxi. Prepare for somewhat warmer weather when traveling from Bend in July: high temperatures in Crater Lake National Park hover around 40°C and lows are around 19°C. Finish your sightseeing early on the 22nd (Mon) to allow enough time to drive to Newport. Shop till you drop at Lincoln City Glass Center and Wave Gallery. Visiting Cape Perpetua Visitor Center - Siuslaw National Forest and Sand Master Park will get you outdoors. Venture out of the city with trips to Heceta Head Lighthouse (in Florence) and Yachats State Park (in Yachats). There's lots more to do: look for all kinds of wild species at Yaquina Head Outstanding Natural Area, immerse yourself in nature at Fogarty Creek State Recreation Area, enjoy the sea views from Yaquina Head Lighthouse, and stroll through Devils Punchbowl State Natural Area. For ratings, reviews, where to stay, and other tourist information, read Newport trip itinerary builder website . Getting from Crater Lake National Park to Newport by car takes about 6 hours. Other options: do a combination of car, flight, and bus; or do a combination of taxi, train, and bus. Traveling from Crater Lake National Park in July, you will find days in Newport are much colder (20°C), and nights are a bit cooler (11°C). Finish your sightseeing early on the 25th (Thu) to allow enough time to drive to McMinnville. McMinnville is the county seat and largest city of Yamhill County, Oregon, United States. Start off your visit on the 26th (Fri): examine the collection at Evergreen Aviation & Space Museum, admire the verdant scenery at Sokol Blosser Winery, then learn about winemaking at Domaine Serene, and finally learn about winemaking at Ponzi Wine Bar. On the 27th (Sat), you'll have a packed day of sightseeing: learn about winemaking at Natalies Estate Winery, then do a tasting at Adelsheim Vineyard, then do a tasting at Carlton Winemakers Studio, and finally steep yourself in history at Tillamook Air Museum. To find ratings, more things to do, and tourist information, read our McMinnville trip itinerary planning app . Getting from Newport to McMinnville by car takes about 2 hours. When traveling from Newport in July, plan for much hotter days and about the same nights in McMinnville: temperatures range from 34°C by day to 14°C at night. Cap off your sightseeing on the 27th (Sat) early enough to travel to Astoria. Do some cultural sightseeing at Fort Clatsop National Memorial and Columbia River Maritime Museum. 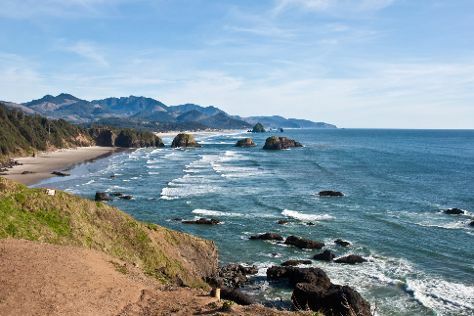 Escape the urban bustle at Cannon Beach and Astoria Column. Explore the numerous day-trip ideas around Astoria: Cannon Beach (Haystack Rock & Ecola State Park). Next up on the itinerary: examine the collection at Flavel House Museum. Take the guesswork out of planning a Astoria vacation by using our trip itinerary maker. Getting from McMinnville to Astoria by car takes about 2.5 hours. Traveling from McMinnville in July, expect nights in Astoria to be about the same, around 15°C, while days are little chillier, around 24°C. Cap off your sightseeing on the 30th (Tue) early enough to go by car to Portland. Satisfy your inner culture vulture at Pittock Mansion and Eastbank Esplanade. For shopping fun, head to Powell's City of Books or Northwest (Nob Hill). 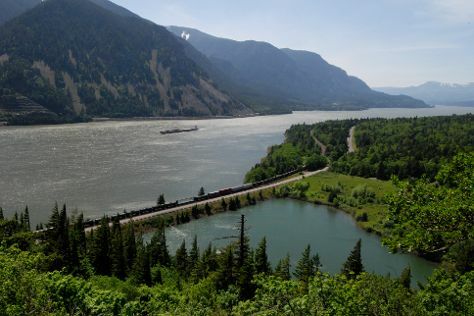 There's much more to do: steep yourself in history at Columbia River Highway, take a stroll through Ladd's Addition, sample the tasty concoctions at Clear Creek Distillery, and hike along Wildwood Trail. To find photos, maps, and tourist information, go to the Portland trip itinerary planner. You can drive from Astoria to Portland in 2 hours. Other options are to take a bus; or do a combination of bus and train. Traveling from Astoria in July, expect nights in Portland to be about the same, around 17°C, while days are a bit warmer, around 33°C. Finish your sightseeing early on the 2nd (Fri) to allow enough time to travel back home.